Hiking down the PCT at age 75. I began my wandering ways in the foothills of California. Avoiding the wrong end of a skunk in the woods seemed infinitely more attractive to me than being bonked on the head by a Little League Baseball. The sixties saw me off to Berkeley and the student revolution and then on to Africa and the Peace Corps. Then, in rapid succession I worked as a teacher in Philadelphia and a Peace Corps recruiter out of Atlanta and Sacramento. Earth Day 1 pulled me into the environmental movement which eventually led me into working as a health advocate doing battle with the tobacco industry. My love of the wilderness led me to create the American Lung Association’s Trek program, which happily kept me leading wilderness trips for over 20 years. Every few years I quit whatever I am doing to roam the world for six months to a year. I have been a janitor, pear picker, teacher, recruiter, wilderness guide, executive director, fund raiser, professional lobbyist, campaign director, writer, house husband, and well, the list goes on. My resume is not one to inspire a potential employer, or a potential wife for that matter. Peggy smiles whenever anyone asks me to describe what I do. My latest job title is author. 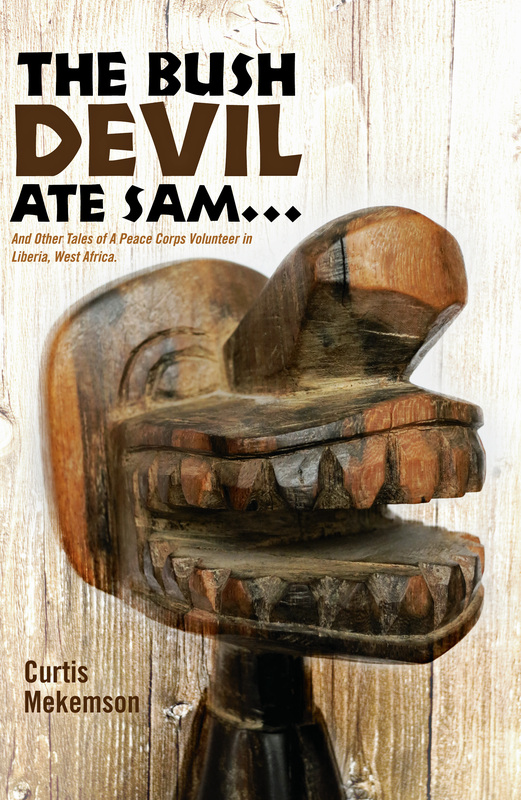 A book about my Peace Corps experiences in Liberia, West Africa. It is available on Amazon here. This past year I celebrated my 75th year by backpacking 750 miles down the Pacific Crest Trail. I am presently writing a book about the experience supplemented by my adventures from over 50 years of backpacking. The working title is “It Is 4 AM and a Bear Is Standing on Top of Me.” And yes, I have actually been awakened by a bear standing on me. Its snout was six inches away from mine. I met Peggy in 1989 when I finished a 10,000 mile solo bicycle trek around North America. I had been through one marriage and several relationships. They were all good. But it was love at first sight with Peggy. All I had to do was convince her and her children, Tony and Tasha, that it was mutual. The first time I took Peggy backpacking, the 14 old Natasha made her mother a sweatshirt that said, “Don’t Mess with the Mama.” She came around, eventually. Like Peggy, I love to read and do photography. A recent photo of Peggy enjoying the beach in Puerto Vallarta. You may wonder how a nice Midwestern girl from Ohio who went to college at Mary Baldwin and the University of Tennessee, became a special-ed teacher, married into the army, and ended up as an elementary school principal, eventually hooked up with a man who prefers wandering to work. You are not alone. I first met Curt when I was employed at the American Lung Association in Sacramento and was between lives, so to speak. He walked into the office pushing his bike. He was, uh, quite svelte in his tight fitting bike clothes. Things evolved from there. “Curt’s a safe date,” my sister Jane, who was Executive Director of ALASET and a long time friend of Curt’s, assured me. Safe for what? After 30 years I am still working on that question. I have two great children, Tony, who flies helicopters for the Coast Guard, and Natasha who is a teacher in Charlotte, North Carolina. Both are married— Tony to Cammie and Tasha to Clay— and have children. Since it is the digital age, I have three million four hundred and forty two pictures (slight exaggeration) of the grandchildren: Ethan, Cody, Connor, Christopher and Cooper. Curt, who didn’t have any kids, quickly and easily slipped into the role of Dad and Grandpa. Beyond travelling, my hobbies include photography, reading, playing the guitar, quilting and creating unending projects for the grandchildren. Love the bios! I chuckled all the way through!Well written and fun to read. Can’t wait to read the other parts-when I don’t have a two year old crawling all over me. Although, he immediately recognized, G’ma hovering over the crater in Death Valley, and G’pa rowing the boat! Bone will be visiting Nashville/Hendersonville in a month. He is hoping that some grand adventures will be arranged for him. I don’t think we ever met, but it seems likely we were in Liberia about the same time. My Peace Corps training was in Gbarnga and I was stationed in Kakata from 1967-70. I found your blog by googling 1955 Liberia Kerosene doing research for an upcoming staged reading of a stage adaptation of my novella STORY FOR A BLACK NIGHT (a copy of which I shall send you, if you reply to my email account at boblocke@csus.edu). The book came out in 1982 (Houghton Mifflin) and was named Phoenix Honor Book in 2002 as a book for children in the English language that has “endured”. It’s a gripping mostly true story told to me by the mother of one of my students who invited me home to dinner. And thus began my career as Clayton Bess, writer for children and young adults. The reason I am doing this research is because I need to find out (for staging purposes) what kind of illumination this woman would have had for her hut, about one hour outside of town, in 1955, no other huts nearby. The dramatist has stipulated a candle in a bottle, but that doesn’t seem right to me. My own novel does claim (but now I’ve been wondering about it) that the family would have had a kerosene lamp, and I think that is the likeliest illumination, that far out of town. I guess they would have carried 5 gallon cans of kerosene an hour, and then husbanded every drop. P.S. I am anxious to browse your blog, love the Liberian stuff I’ve found here, recognize it all, remember it too well, too fondly, too sweet. If you are in the L.A. area in March, the proposed staged reading is going to be at the Simon Wiesenthal Museum of Tolerance, if all goes well and the crick don’t rise. It is always fun to hear from other Volunteers that served in Liberia. My best guess is that your group served as our replacements. I would have been involved in the training had I still been living in Gbarnga at the time. I would love to hear more about your experience. I am also interested in learning more about your book and your writing career in general. I am not sure about lightning in 1955. I am still in contact with my ex-houseboy, who is now a physician, but who grew up in a village in the late 50s. If i can catch up with him, I will ask about lighting. I will also pose your question on the Friends of Liberia site on Facebook. I have a new book written by a school friend of mine last year who is a descendant of John Brown,Martyr and Covenanter Of Priesthill.I have told him about you and he would dearly love to get in touch,so I said I would try to trace you for him. Please contact me robin_linda 2001@yahoo.co,uk for further information as soon as possible. I really like the tetuerxs on both the ponytail and the one with the weird braid. They look good with light hairs. They don’t have the typical too-dark base to it.The ponytail is really pretty, but it sits so high on the head, it looks like I have a majorly receding hairline 😦 If it was lowered down a bit, it would be the perfect ponytail, imho <3The one with the braid…. I was worried about a big bald spot at the hair part. But there is none that I could see. It's really pretty. But that braid is way too thick at the base. But that's just personal preference. I would love to see a version of it without the braid, but it's not as simple as chopping the braid off. It would need some reshaping at the top to cover up where it used to be So I don't expect we'll see a version without. I always love reading about Peggy and Curt’s latest adventures and musings and am very proud of my little sister! I love how you did your bios! Can’t wait to see where Bone heads next. Hey Jay, Bone is off to the Big Island of Hawaii and then Burning Man in the next three weeks. What’s the old saying, a rolling Bone gathers no calcium deposits? How about going letter boxing with Ethan when you reach Nashville? Heard it dates back to the 1800’s. There are several treaures to find in the area including one at Rock Castle and another at Old Hickory Nature Trail. Bone might have to create his own handmade stamp to participate. Where is Marshall these days! I met him camping in Martin County . . . and what a great guy! Tell him Dave Williams said hellp and I need some more pointers on great places to camp in Florida! I will tell Marshall you are requesting more Florida campground info when I talk to him again. He is an encyclopedia of info on free camping and living inexpensively! I could use some pointers myself. Curt, Mary Brewington Johnson here. Please respond off line in an email. Would like to get in touch. Thanks for checking in Mary… Always enjoy a voice from the distant past. If you haven’t caught it yet the Macomson families of Georgia are distant cousins. Hello, thank you very much for visit my site. You have a nice site too. Cheers! I would like to read your blog on petroglyphs. Wish you had a “search” feature! Hi Curt, I am a blast from the past and I’m trying to reach Peggy… this is Mary Schoenfeldt… did contract work in school safety for PCOE. Can you please ask Peggy to contact me at yoursafeplace@msn.com. I’m trying to track down Peggy, Ken and Tad to tell them some news and thank them for being a motivator and supporter for my work. Love your interests and curiosity. I stumbled on your bios as I was trying to copy and paste the blog link to my sister’s email so she could follow as well. So, admittedly I just gave them a cursory glance and then…, I got drawn in by the comments –“I love how you did your bios,” etc., etc. I thought to myself, how can anybody do a bio that would elicit that response, so I scrolled up. (I’m always in a hurry you see) Oh yes, I heartily agree.. Your bios are great. As with everything you write, just great. Unique, funny, adorable really, with a great deal of warmth and even humility. And. I didn’t really know how you met. It’s a wonderful story. Thanks. Yes! You got a great gal there, and visa versa of course. You guys are wonderful together. An inspiration to all of us really…. Think maybe I should check the itinerary next time Bill pulls his bike out. Hi, I am trying to get a hold of Ken Lake, I took a class of his a few years ago and his email does not work. Can you help me contact him? Thx! Curt, I have been reading your blog with great interest. I’m in my 50s and have traveled extensively in the world as a govt employee. I’m reflecting on the many times I interviewed Peace Corp folks, at the time it was just part of what I did, I did not give them much credit for the work they were doing. Now I’m circumspect that I was able to gain the correct insights because my view of the world was guided by a policy perspective. Your experiences moved me to appreciate that measuring inertia is short sited, improving the conditions of people is so much better that being an observer. Thanks for your service, the world needs more people like you. I just found your site and want to know if you may be interested in providing a guest post for our retirement site, Retirement And Good Living (http://retirementandgoodliving.com) about your travels. Currently the blog section of our site is comprised entirely of posts by guests on a variety of topics. To date nearly 150 guests from around the globe provided posts for our blog. Hi Curt. Thanks for your reply. You have had an incredible life and a post on one of many topics would be great: Your Peace Corp experiences, Your wilderness trips, your many jobs allowing you to do what you want, places you would recommend to others (older adults:-) to travel to, etc. Please send me a direct email and I will send you a page for your post submission. Hi Curt. How come you’re not on the FS Archives mailing list? Big plans for the 50th this fall. Such a wonderful space you have created. Looking forward to following. Hi Peggy and Curt. I wonder if you might be able to send me your contact email so that I can get in touch directly? Many thanks, Becky. Hi Becky, you can reach us both at curtandpeg@aol.com or me at cvmekemson@gmail.com. When were you in Liberia, Curt? I spent some time in Ghana doing volunteer work, during the summer of 1980. I think the troubles were just beginning then in Liberia – I was supposed to go there but then they sent us to Ghana instead. And Peggy – you went to Mary Baldwin, as in MB in Staunton, VA? I live an hour’s drive from that place 🙂 The world is small, isn’t it?! I went to Ghana with Operation Crossroads Africa. They still send groups of people (mostly students, some professionals) to different countries there, for a summer. It is typically a life-changing experience for most participants. It was for me! member of this con­ference, and also was a representative from Northumberland county in the convention which assembled at Philadelphia on the 15th of July, 1776, and which declared the independence of the colony and formed the first State Constitution, which he signed September 28, 1776. Ahhh… and those McCormicks? And it turns out that Mathew Brown was a well known guy there in revolutionary times but now with a memorial surrounded by state games lands. How this happened is another story for another time. But… you should read about Mathew Brown… and his wife Eleanor Lytle if you havent already. Then… soon, it turns out the Browns and the McCormicks apparently got along well… the marriages are multiple and frequent. The subsequent McCormicks being PA AG and well ,,, fairly famous for other stuff as well. Cyrus? Finally, the Stagers? Emigrated to the US from Germany about the same time as the Browns and McCormicks from Ireland and Scotland… via Paxtang Pa. Up the Susquehanna towards Dauphin County, Lancaster, Lebanon, Miltown and Watsontown and Allenwood. Which brings you to me. And me to you. We’re related… but way way back! Who knew? Hi Peggy i’m doing a project for my computer graphics class and I was wondering if it was alright if I use your picture of the big foot trap with your permission? Its only for a high class project so its not going to be printed out or anything. I had fun browsing around, though! If you have a second could you send me the link, please? Sounds like a great run. I would think you’ve had a perfect resume – all sorts of transferable skills. Always thought people/companies would be better off if everyone took a change of direction every 5-6 years and reinvented themselves. Used to drive my parents crazy when I did it. Blog looks really interesting thanks for stopping by mine and giving me a head’s up. Enjoy. I hope it is helpful, Gwen. Love it! Your words and pictures, both are like well travelled, shall we say. I worried about you and Debra when Peggy picked me up, Denise. The smoke moved from campfire size to filling the sky in a matter of minutes. 30 minutes after we reached Highway 395 they had closed Sonora Pass. Did they pull you off the trail? Love, love ❤ this bios page that's either new, or one I hadn't seen before. You two are amazing and there's this magical thread that runs through your story that strikes a chord of familiarity with me! Curt, I've loved following your blog since I found you thanks to comments you posted at Andrew Petcher's blog. This is such a great online community in so many ways. Glad you two found each other! Like the new format, too, BTW. What a life and career. Kudos. Love your Mary Baldwin Wallace and UT lady! My teaching career began at Tenn. Tech U in Cookeville. Congrats on the Sunshine Blogger Award from Annika Perry. Lovely post and thanks. Keep on walking! A daily dose of humor makes life a happy one. Thanks for the comment.